Hi friends! I had fun playing with my stamps and Big Shot tools today! I even tried my hand at a challenge. Hopefully my card qualifies, but if not; oh well. 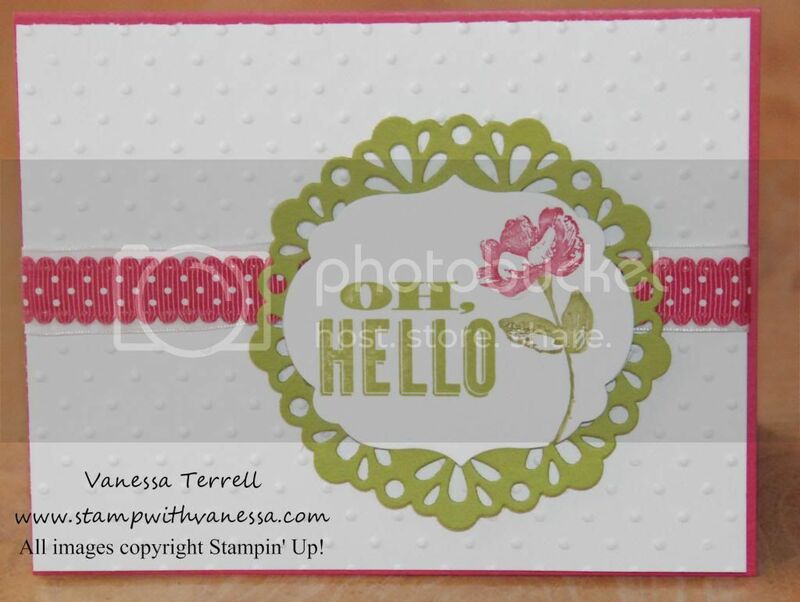 I stopped by the Try Stamping On Tuesday Blog to see what sketch they were featuring for the week, so I thought I would give it a try! Here is the sketch for the week! So I decided to use the Oh, Hello stamp set from the Spring Catalog in some of my favorite bright colors that I like using and then I couldn't resist using my Big Shot! I tell you that is the best investment I have made to complement my stamps! Here is what I came up with! Just a few details on my card, I colored the image with the Melon Mambo and Lucky Limeade Ink and I used a Stamp-a-ma-jig for placement. I layered two ribbons behind the Delicate Doilies Sizzlits, the Whisper White Organza and Melon Mambo Scallop Dots Ribbon. All this is layered on top of Whisper White that has textured using the Perfect Polka Dots Folder. Thanks for stopping by and for more fun in your email, subscribe to my newsletter! I love the energy you put into your blog writing as well as the creative projects you come up with here. I work primarily in mixed media art so yes, this attracts me a lot. So glad you finished the ultimate blog challenge. Hasn't it been a blast? Hi Vanessa, I really like this card. I think all the details on this card are just wonderful. I really like your take on the sketch. Thank you for playing along with us on Tuesday. Beautiful, inspiring creations. You have a wonderful blog. Thank you for visiting my blog. Hi Vanessa, SO many gorgeous creations here. The doily on the card is a great design element. Love it! Yep, the big shot is the best tool! Love your card, so bright and cheery! 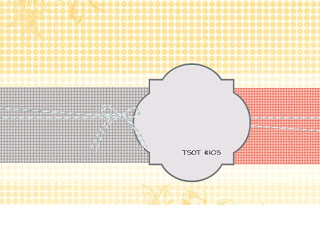 Fabulous job, thanks so much for playing along with us on the TSOT blog!